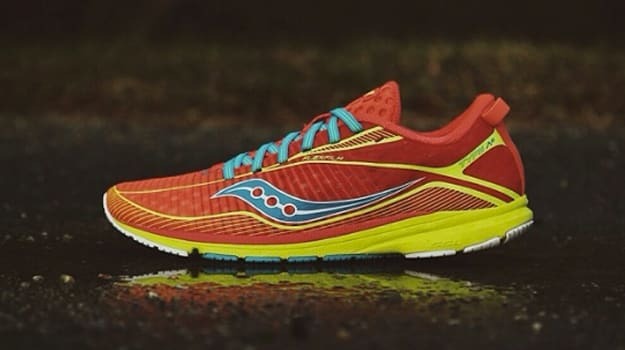 Saucony fans: looks like you won’t have to wait until February to lock down a pair of the Type A6 racing flat after all. While the shoe won’t ship out for another couple of weeks, runner can now head over to select running specialty retailers to pre-order a pair of the highly anticipated Type A6. Featuring a pretty hefty redesign, the Type A6 drops the fierce dotted upper design seen on the current model in lieu of a refined look that’s equally as impressive visually (if not better). In addition to aesthetics, the next generation Type A series comes armed with a series of performance updates. It’s slightly lighter at 5.4 ounces—not much of a change from the A5’s 5.6 oz weight, but hey, every little bit counts when you’re trying to best your PR.